and Social Impact for Christ. This past week I was asked by Mr. Brown, to speak about real estate in his economics class. They are starting their economics business project. 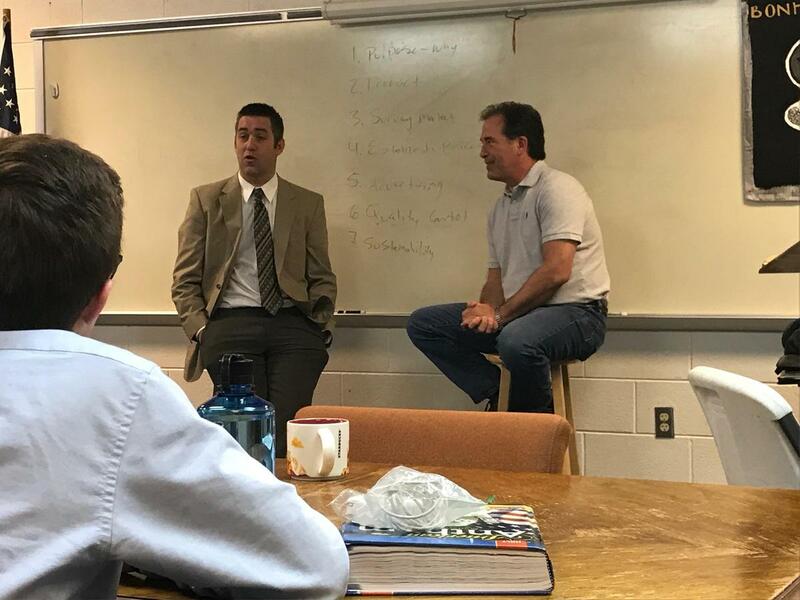 We viewed the parallels of running a business for the class project, the business of Berean Christian School and running a real estate business. It was a good discussion and encouraging to hear the seniors engage the topic. For the past seven years, my wife and I have learned a lot in the business arena. Kirk Finnerty has been working for years in it and has many good stories that help illustrate many points of sound practice. We discussed surveying the market, advertising, bringing a product to market, price setting, asset protection, product control, sustainability, etc. Mr. Brown has done this class assignment for years and it has been great to see the students take it seriously and some have since found a lot of success. One of the age-old questions in education is “When am I ever going to use this stuff?” Class projects, internships, guest speakers, creative thinking all help students build skills that can translate directly to the business world. We also want to continue to draw in parents, as many of you are entrepreneurs and have found achievement through sound business practices. Linking some of our courses to this entrepreneur’s hub is also something that we intend to do. We now have an OSE (out of school experience) course, computer/marketing, personal finance, government and econ, landscaping, and what next? Such guest speakers, courses and creative internships can and do support our core values. We must be excellent at what we do, look to grow, give back and seek God’s blessing. As we do so, we look forward to building good education and good business skills that can serve God’s Kingdom well. If you would be interested to come into our school to give a 30-minute presentation about your business, that could be very valuable and encouraging. Please let me know.